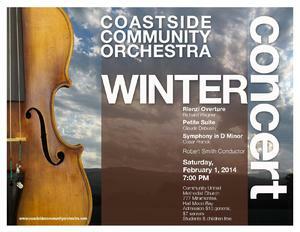 The Coastside Community Orchestra’s Winter concert features Wagner’s Rienzi Overture, Debussy’s Petite Suite and Franck’s Symphony in D Minor. 7pm at the Community United Methodist Church, 777 Miramontes St, Half Moon Bay. Tickets available at the door. Doors open at 6:30 p.m. Suggested donation $10, seniors $7. Students and children free.